Souvenirs - We’ve all purchased them. Sometimes we buy them at a shop that sells them by the boatload, sometimes we find them during a morning walk on the beach, and sometimes we keep them in the pictures folder of our smartphones. We covet souvenirs because they serve a very real purpose for us. They help us remember. One look at that refrigerator magnet brings us back to a time that we don’t want to forget. Holding that seashell transports us to place where we were truly happy. While we can’t advocate enough for souvenirs, the truth is, overtime, many of these keepsakes become lost in our vast collections of stuff, buried by more magnets and more seashells. But what if these souvenirs were completely unique? What if your souvenir was made especially for you? For some one-of-a-kind flair to take home after your visit, there is no better option than buying handmade. With artisans of all varieties specializing in everything from pin-striping to leatherworking, in the ViBe Creative District and beyond, Virginia Beach has the goods for a truly unique and long-lasting memento that will always be treasured. 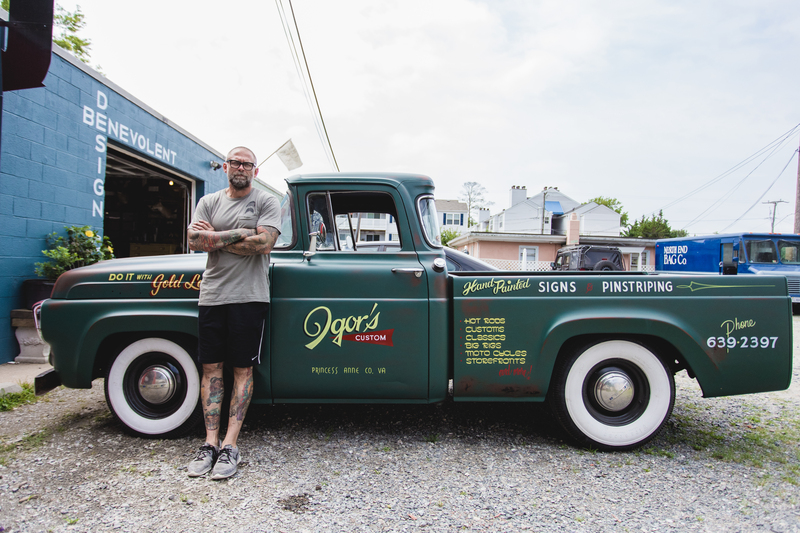 For custom, hand-painted signs and pinstriping, check out Igor’s Custom, a ViBe District favorite, whose work is found all around town. His designs are done the old-school way, so you won’t find any computers in his studio. To have something personalized, just stop in and talk to the artist, himself. While Igor’s work is worthy of a place on your wall on it’s own, add in the fact that Igor is personally responsible for the logo design of a many local and regional staples, including Virginia Beach’s Bay Local Eatery, Three Ships Coffee, and Back Bay Brewing, among many, many others, and how could this not be the perfect souvenir? Located next door to Igor’s, in a strip of shops called The Alley, which also includes the awesome custom-designed, handmade furniture shop, Benevolent Design Co. (Definitely worth popping your head in to say hello!) and Three Ships Coffee, one of our favorite spots for a house-roasted pick-me-up, North End Bag Company is crafting handmade luxuries you will be proud to take home with you. Their specialty is leather bags from scratch, using a variety of multi-era vintage sewing machines. From when the design is sketched to when the sewing machine whirs to a stop, no detail is overlooked in building these timeless and sturdy bags. Whether you use them to hold your wet swimsuit or stuff them with sand dollars straight off of the beach, these bags are built to last on your next beach adventure and more. 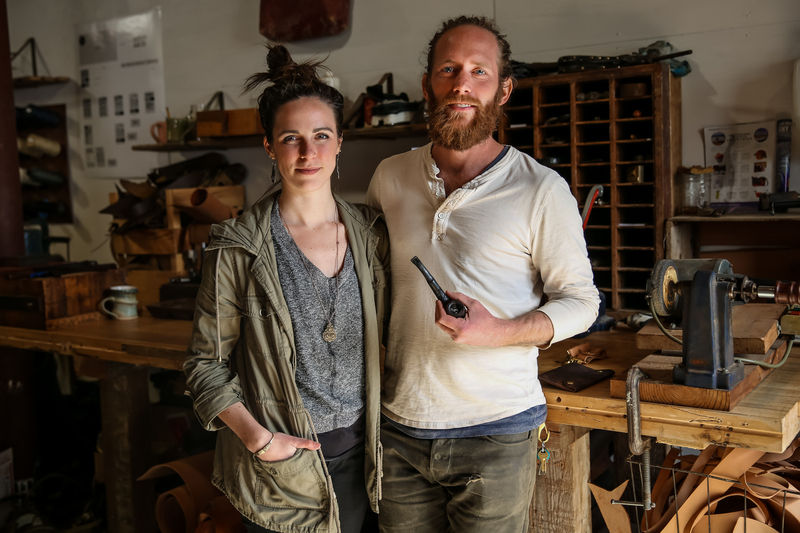 For some beautiful wood and metal work you can take home with you, check out First Landing Woodworks, whose mantra is that no product should be disposable, but instead well-made and worthy of passing down for generations. For the perfect accompaniment to your Virginia Beach vacation, don’t miss their pristinely made oyster shucking knives or hand-crafted bottle openers you’ll want to show off to your friends. The attention these guys pay to each and every product they make is astounding and well-worth the investment.